Laurel Foodsystems is a vending and foodservice leader in Pennsylvania and West Virginia. With eight locations in Pittsburgh, Greensburg, Altoona, Wheeling, Butler, Brockway, Morgantown, and Johnstown to service our customers, we give the highest level of service that is available, for over 100 years! Learn more about our family's 100 years of service related business here. Central warehousing and purchasing are also at our main location. We stock thousands of dollars of candy, soda, milk, juice, snacks and other inventory needed for the operation and control of branch retail locations in three states. Our fleet of Tractor Trailers makes daily deliveries to our nine Branches. Laurel Foodsystems has a complete Refurbishing Shop that paints and rebuilds all types of vending equipment. 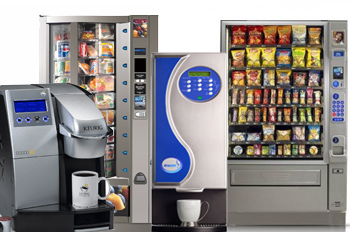 Included is a large inventory of parts, motors, circuit boards and miscellaneous repair supplies to maintain over 7,000 vending machines and related equipment. All branch locations and repair vehicles have an inventory of the most commonly used repair parts; back-up parts are shipped on a same day basis from our facility. All of our service technicians are trained in Federal guidelines for refrigerant reclamation so that repair of all refrigeration units is accomplished promptly in-house. Our operations are computer driven, so that complete control of product, cash, maintenance histories, parts inventories, etc. is immediately available on-line. Our technology and modern equipment is designed to save you money and make your day more convenient. Laurel Foodsystems can serve the needs of any size office. Below is just a sample of what we can bring to your company! Laurel Foodsystems operates the latest in name brand equipment with the most recent technological advances, such as vendors with magnetically validated dollar bill acceptors and coin changers. Most of our equipment has computer controlled diagnostics and pricing which enable us to have complete accuracy of the cash a machine has accepted and products sold. We use the most modern hot beverage machines available which serve coffee by grinding coffee beans for each individual cup purchased. An internal computer controls the amount of cream, sugar or sweetener for each cup. There are two cup sizes and an electronic cup sensor that determine if a customer wants his own mug filled or wants the machine to dispense a paper cup.